Bushy shrub to 0.5m tall. Leaves bright green, scattered, to 6.5mm long. Flowers terminal clusters of 8–20; calyx cup-shaped, 4-lobed, pale green; corolla campanulate or funnel-shaped or conical, white or pink; stamens 8, included, variously malformed; anthers degenerate, without awns; pollen observed. 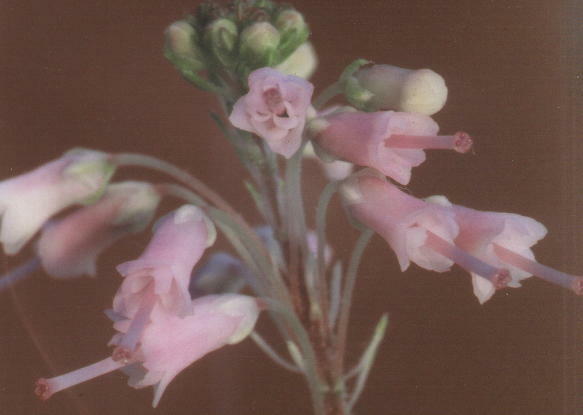 An artificial hybrid, created by Kurt Kramer (Edewecht, Germany), from the Eurasian species Erica spiculifolia (Balkan heath) and the African (Cape) species Erica bergiana. Hardy and long-blooming (April to November). Two cultivars have been named. Uncommon in cultivation in Britain and Ireland, yet the clones both thrive in gardens in the northwestern USA and western Canada.